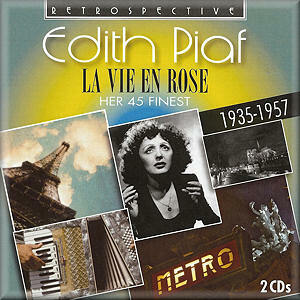 With two hugely well filled CDs the question here is; do we really need yet another Piaf compilation and if we do what does this one offer that others don’t. And add a subsidiary but by no means unimportant rider, namely; what are the transfers like? The first is quite tricky to answer. We start with a post-war track in media res but immediately go back to 1935. Naturally that opener is La Vie en Rose and it gives a warm, nostalgic feel to the retrospective. But why not come to it chronologically? One can object that it’s easy to programme things and one won’t listen even sequentially to two discs, and that there are chronological jumbles on the second disc. Which is where that track should be, and I still think it shows fallible decision-making. And the 1948-55 tracks are rather skimpy – there are only seven. One can argue about such things for a long time. Many of the great songs however are here. So we have the chansons, and funereal reflections, the cynical parlando, the tough sentiment, the superior orchestrations, and devoted piano accompaniments, the genial composer collaborators (Marguerite Monnot for example, prominently), the film music (J'ai Dansé Avec L'amour), and the nuanced violin obbligatos (C'était Une Histoire D'amour). There are things we can’t be without - Les Trois Cloches – and the more clichéd big production numbers (principally Un Coup De Grisou). We have Piaf soaring defiantly over the chorus-strewn C'est Pour Ça and an early example of where her defiantly histrionic talents would take her later in Dans Les Prisons De Nantes, with Les Compagnons De La Chanson. It’s a strong, successful number but one that presages the vibrato-throb extravagances of her later years. I’ve always thought her New York recording of Autumn Leaves, in English, sabotaged by the glutinous arrangement (originally it’s Joseph Kosma’s song Les feuilles mortes and the words are by Prévert). Enough then about selection principles. The transfers vary. I prefer EMI’s own work by and large. For example the EMI Eternelle release [07243 593866-2] had far more of an open treble, especially in the earlier numbers. This Retrospective sounds rather too airless. Neat notes by Peter Dempsey.